Q: What is the difference between a buffer, a file, a window, and a frame? Emacs predates contemporary window-based operating systems, so its terminology also predates the current terms. Unfortunately, it means that new users and experienced users sometimes have trouble making themselves understood to each other, since they're using the terms in different ways. The following annotated screenshot illustrates these points. This Emacs session has two frames (blue outline) -- what, for most other programs, we would call "windows." 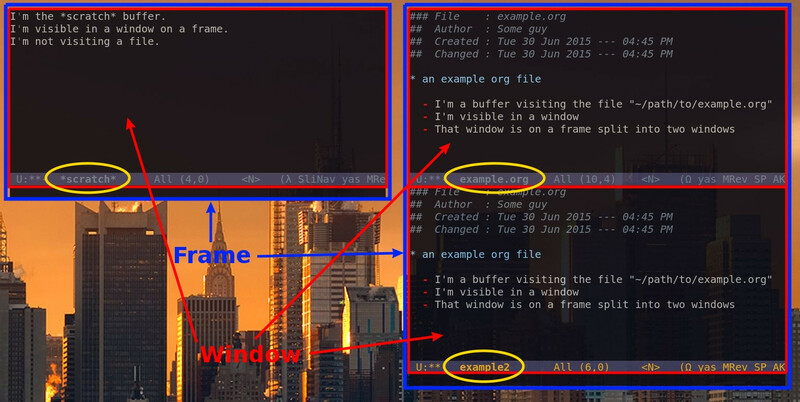 There are a total of three Emacs windows (red outline) open: one in the left frame, and two in the right frame. The single window in the left frame is displaying the scratch buffer. It is not connected to (i.e., visiting) any file. The top window in the right frame is displaying the buffer example.org, which is, in turn, visiting the file ~/path/to/example.org. The bottom window in the right frame is displaying the indirect buffer example2, which has the same contents as the buffer example.org in the top window. I would point readers to (1) The glossaries of Emacs Wiki and (2) the Emacs manual for such information. Also to the EmacsWiki Newbie page, which has lots of good introductory information about such things. And to the Emacs manual in general, which also introduces such things well: C-h r then i followed by typing whatever you want to learn about, e.g., window. The EmacsWiki page linked from its glossary for entry window includes this graphic, which shows a frame with 3 windows, and indicates the menu bar for the current buffer and the mode lines of the windows. The 3 buffers shown in the windows are named *Help*, drews-lisp-20, and shrink-fit.el. Not the answer you're looking for? Browse other questions tagged buffers window frames files or ask your own question. Quick way to close all but one window, and then revert to previous window setup? How do I outline/hide/show text when writing prose? How to get the buffer's visible width? How can I disable the resize grip? In non-terminal Emacs, how do I make new frame open within the same OS window?